An example of a Random New World (as of the 1.14 RNW rework). Random New World is an option that can be selected in the nation select screen. The option replaces everything west of the Azores and Iceland, and east of Eastern Siberia, Wake Island, and New Zealand with new landmasses. Rather than procedurally generated maps (as was done pre 1.14), the random new world is constructed from a number of pre-set tiles (128 different tiles) joined together to produce a more realistic set of landmasses. The selection of tiles are weighted to ensure interesting and balanced maps, such as ensuring there is a map tile marked as a "continent" to ensure at least one large contiguous landmass to colonize. The generator then proceeds to apply different scenarios (26 different scenarios) to the generated landmasses. Each scenario is applied per region and take into account land size, climate and other modifiers. The more basic scenarios populate the new world with random numbers of nations, based on cultures and religions in the same fashion of the regular new world. These scenarios provide a variation on the old while at same time providing some uniqueness in the form of themed province name and custom native nations. The more intricate scenarios involve "what if fantasy" worlds depicting things such as a technologically advanced Native Americans, a 'wall' of land at the edge of the world, a mirror continent of the Indian sub-continent and more. All the options can be turned on/off if the player prefers a certain type of new world. Based on where the land masses were placed in the RNW, the dynamically generated Trade nodes can have their trade routes feed into either Asia, Africa or Europe. This can create some interesting situations with some unusual settlers (like east-Asian or African). 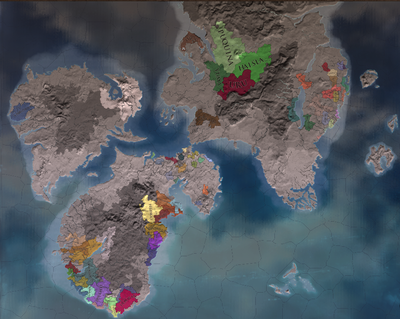 Provinces are named dynamically using a pool of names - with the ability to attach a theme to a name - while regions, colonial regions and Trade nodes take their names from important provinces. RNW nations are also dynamically generated with random flags and accompanying ideas. In the future it is planned to increase the variety of the RNW by adding more tile-sets and adding an option to copy the 'seed' of the new world to be able to generate it again and share with others. In addition, the RNW system is highly moddable and allows players to share their own user-created tile-sets with each other. Note: making modifications to existing RNW files or adding new files will change the checksum. Note: The following stand for: F = Fantasy, T = Temperate. A "-" in the Unit Group column means that it is identical to the tech group. Legend: ICT = Inland Center of Trade, INH = Important Natural Harbor, = Estuary. Note: All the tiles - except johan1 and the water tiles - start with the prefix "tile" (removed here for readability reasons). ↑ Thor Heyerdahl was a Norwegian anthropologist, marine biologist and explorer. In 1969 and 1970, he built papyrus boats (Ra) based on drawings and models from ancient Egypt. In an attempt to rediscover the route of the ancient expeditions, he crossed the Atlantic Ocean, starting from Safi, Morocco and reaching Barbados in the Caribbean Sea, suggesting that Mediterranean civilization might have spread to the Americas in this way. ↑ The name of ancient Egypt, meaning "black soil"
↑ According to a comment in /Europa Universalis IV/map/random/RNWScenarios.txt, Tengri was chosen because in the 14th century, the Knights Templar were known for worshipping the deity Baphomet.